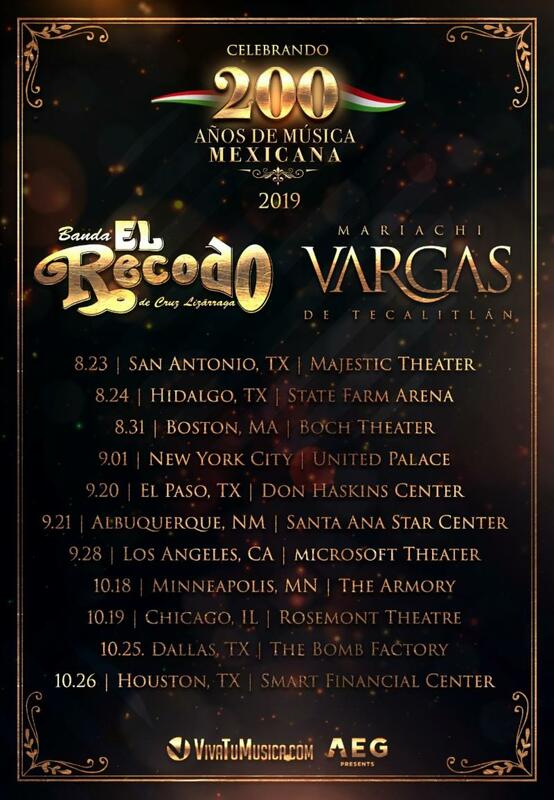 BANDA EL RECODO & MARIACHI VARGAS DE TECATITLÁN UNITE THEIR MUSICAL LEGACIES FOR THE ‘200 AÑOS DE MÚSICA MEXICANA TOUR’ ACROSS THE U.S.
Los Ángeles, CA. (8 de abril del 2019 ). Banda El Recodo y Mariachi Vargas de Tecatitlán , dos de las agrupaciones más legendarias en la historia de la música mexicana, quienes a través de sus inigualables trayectorias han enaltecido el nombre de México a nivel mundial, unirán fuerzas para una gira histórica celebrando su incuestionable legado cultural. En este histórico recorrido, “La Madre de Todas las Bandas” y “El Mejor Mariachi del Mundo” , reunirán generaciones enteras, quienes podrán disfrutar de lo mejor de estos dos géneros musicales, que representan y han marcado pauta en la historia de la música en México y que a través de sus canciones han trascendido fronteras y se han mantenido vigentes a través de los años. AEG Presents es una de las compañías de música en vivo más grandes del mundo. La compañía se dedica a todos los aspectos de los espectáculos en vivo de música contemporánea, incluida la producción y promoción de giras de conciertos a nivel mundial, eventos regionales de música y festivales de renombre mundial. AEG Presents opera en Norteamérica, Europa y Asia a través de 15 oficinas regionales que apoyan sus giras, que incluyen artistas como Taylor Swift, Paul McCartney, The Rolling Stones, Justin Bieber, Katy Perry, Elton John, Celine Dion y Kenny Chesney; produce más de 40 festivales de música, incluido el icónico Festival de Música y Artes de Coachella Valley; New Orleans Jazz & Heritage Festival, Stagecoach California Country Music Festival, Desert Trip, Firefly Music Festival, Hangout Music Festival and Panorama y posee, gestiona o promociona de forma exclusiva en más de 75 clubes y teatros de todo el mundo. AEG presenta más de 8,000 espectáculos al año en todo el mundo y realiza negocios bajo marcas de renombre mundial como AEG Presents, Goldenvoice, The Bowery Presents, Concerts West, Messina Touring Group, Marshall Arts LTD y Madison House Presents. Para más información visite www.aegpresents.com . Los Angeles, CA. (April 8, 2019 ). Banda El Recodo and Mariachi Vargas de Tecatitlán , two of the most legendary bands in the history of Mexican music, which through their incomparable careers have represented Mexico worldwide, will join forces for a historic tour that celebrates their unquestionable cultural legacy. The extensive tour titled “200 Años”, takes its name from the time that together the two groups have remained relevant, present, and successful. Banda El Recodo recently celebrated its 80 th anniversary, while the famed and mythical Mariachi Vargas de Tecatitlán was founded 120 years ago. Banda El Recodo was founded in 1938 by Don Cruz Lizárraga in Mazatlán, Sinaloa. Their music has reached six continents and they have performed in notable international events such as the 2018 FIFA World Cup in Russia. Throughout its more than 80 years of musical history, the band has played alongside legendary figures such as José Alfredo Jiménez, Pedro Infante, Juan Gabriel, Lola Beltrán, Lucha Villa, Antonio Aguilar, among others. The group is also known as “The Mother of All Bands”, because it has been a pioneering force and has lead the way in the evolution of this style of Sinaloan music, becoming the most popular and respected band in the genre worldwide. In 2007 they became the first Regional Mexican band to play at the New Orleans Jazz Festival. They have released more than 200 albums, received tributes around the world, and won important accolades such as multiple awards at Premios Lo Nuestro, Billboard Latin Music Awards, and the Latin GRAMMYS, among many others. Mariachi Vargas de Tecatitlán was founded in 1898 by maestro Gaspar Vargas López. The group is celebrating its 120th anniversary having one of the most important cultural legacies in Mexico and being an emblematic icon of Mexican musical history worldwide. Throughout its history, the mariachi band has performed in more than 40 countries and has collaborated with choirs, symphonic orchestras, dance companies and internationally renowned artists. Over the years, Mariachi Vargas has also played alongside figures such as Jorge Negrete, Pedro Vargas, Pedro Infante, Antonio Aguilar, Lola Beltrán, José Alfredo Jiménez, Juan Gabriel, Luis Miguel, Lucero, among others. Today, the group is under the artistic production and general direction of maestro Don Rubén Fuentes and the musical direction of maestro Carlos Martínez. AEG Presents is one of the world’s largest live music companies. 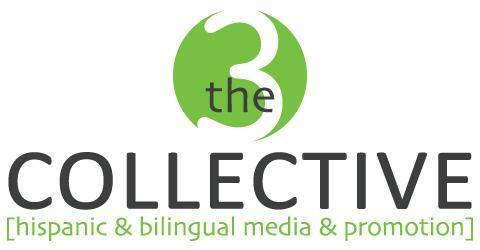 The company is dedicated to all aspects of live contemporary music performances, including producing and promoting global concert tours, regional music events and world-renowned festivals. AEG Presents operates in North America, Europe and Asia through 15 regional offices that support its tours which include such artists as Taylor Swift, Paul McCartney, The Rolling Stones, Justin Bieber, Katy Perry, Elton John, Celine Dion, and Kenny Chesney; produces over 40 music festivals, including the iconic Coachella Valley Music & Arts Festival; New Orleans Jazz & Heritage Festival, Stagecoach California’s Country Music Festival, Desert Trip, Firefly Music Festival, Hangout Music Festival and Panorama and owns, manages or exclusively promotes in more than 75 clubs and theaters worldwide. AEG presents more than 8,000 shows annually worldwide and conducts business under such globally renowned brands as AEG Presents, Goldenvoice, The Bowery Presents, Concerts West, Messina Touring Group, Marshall Arts LTD, and Madison House Presents. For more information visit www.aegpresents.com .